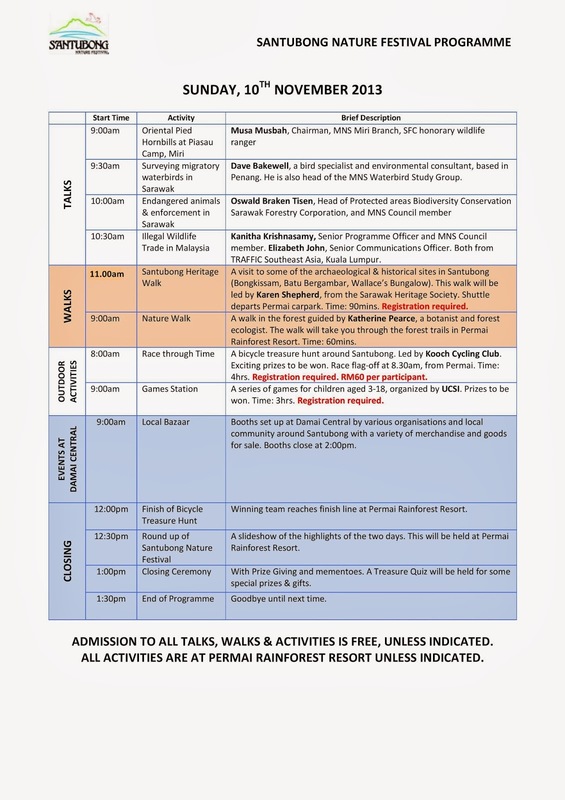 The festival will consist of talks, walks, workshops, outdoor activities and entertainment to keep nature lovers occupied and children captive. Held from 9th to 10 November 2013, each activity will either be led or presented by an authority of the subject matter. 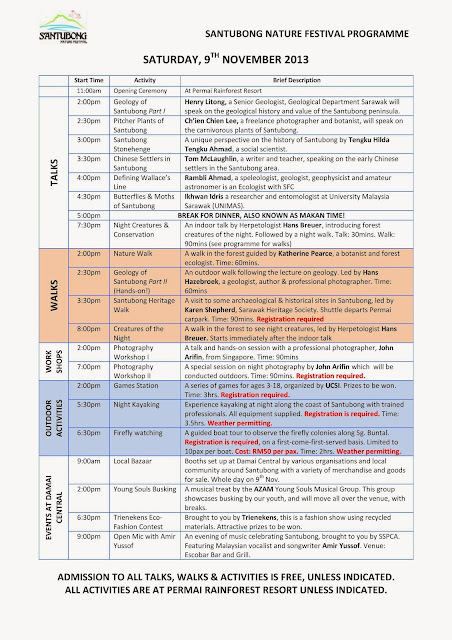 So, if you are into natural and historical heritage of significant regional and global value, this activity-packed festival has something for you. Admission is free for all except the firefly night tour which costs RM50 per person. Registration is required for some of the activities. 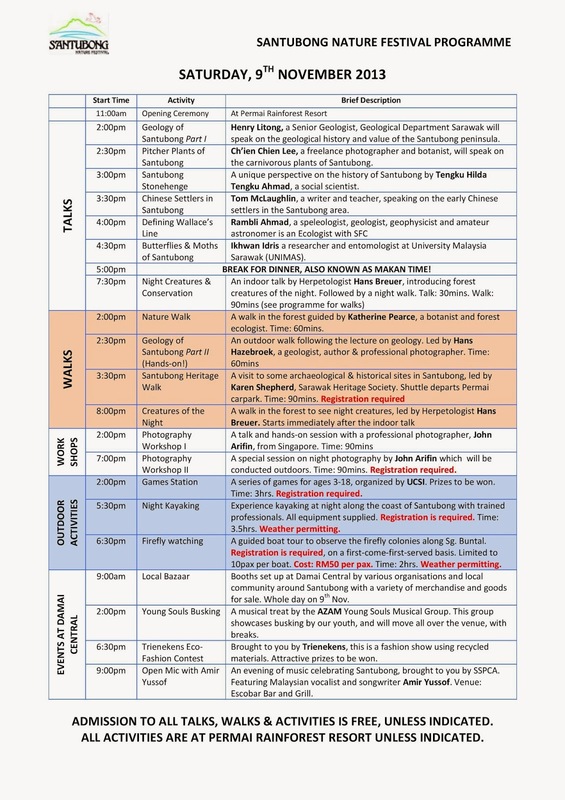 Here are the programmes for the two days. You may want to zoom your page display for better clarity. The Santubong Nature Festival, an annual event, takes place in the scenic peninsula of historical Santubong. The skyline is dominated by the legendary Mt. Santubong with the South China sea washing its shoreline. 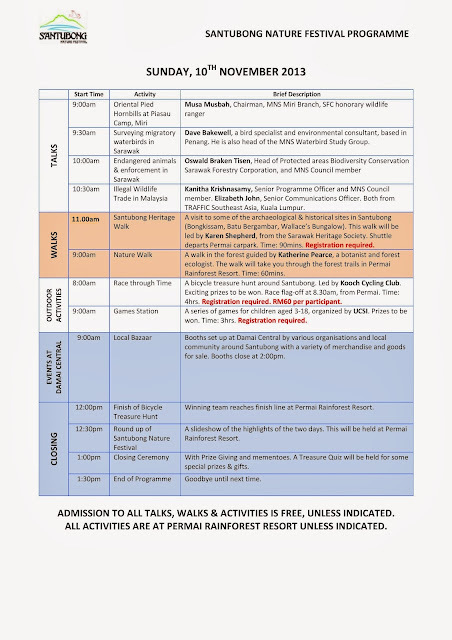 The festival will be centered in the Permai Rainforest Resort It is organised by the Malaysian Nature Society (MNSKB) Kuching Branch. The peninsular has plenty of wildlife, rustic villages, resorts and the award-winning Sarawak Cultural Village. Historically, the peninsula is where the famous 19th century British naturalist, Sir Alfred Russel Wallace wrote 'Sarawak Law' paper, the precursor to the theory of evolution. To register for some of the events, this is the email contact.